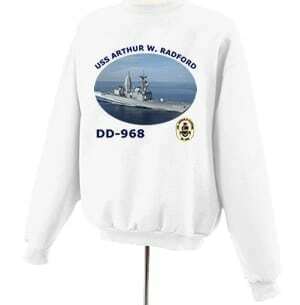 DD 968 USS Arthur W. Radford photo sweatshirt. DD 968 USS Arthur W. Radford Photo Sweatshirt. Stylish USS Arthur W. Radford graphic showing picture of ship, ship name, hull number and ship insignia appears on front of sweatshirt. Available sizes are Adult Small through Adult 2XLarge. Sweatshirts available in either white or light gray colors.